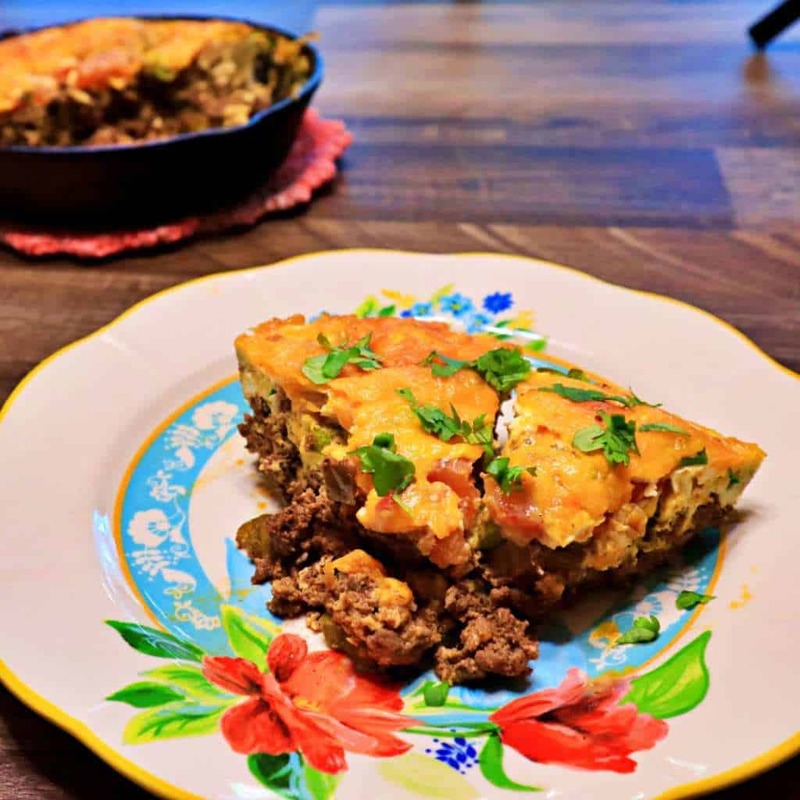 This Keto Frittata Recipe is versatile and delicious enough to be considered both a breakfast food and a main course. And if you like eating Breakfast for Dinner than this is a real Win/Win! We will sometimes make this as part of a weekly meal prep plan too, because it does store well in the fridge, you can freeze it, and it reheats really well in the Microwave too if you want to take it to work. Sometimes it is the simple meals like this that help keep you on track with eating Keto. Prepare your vegetables by dicing the Bell Pepper into 1/2″ chunks, Removing the Cilantro Leaves from the stems and chopping them up, cutting the Green Onions into 1/2″ long sections, and slicing the Roma Tomato into at least 5 good slices. Prepare the Seasoning Mixture by combining the Chili Powder, Black Pepper, Salt, Granulated Garlic, Onion Powder, Oregano, Paprika, and Cumin in a small bowl. Shred 1 Cup of Cheddar Cheese and set aside. In a Mixing Bowl crack 8 Cage-Free Eggs and whisk well. Pre-Heat the Oven to 375*F.
Bring a Cast Iron Skillet or Oven-Safe Skillet up to temperature over Medium-High Heat on the stove and add 1 TBSP of Olive Oil. Then add the 1/2 Pound of Grass-Fed Ground Beef, and lightly brown while mincing well. Season the Grass-Fed Ground Beef with the Seasoning Mixture prepared in Step 2, and add 1/2 Cup Sugar Free Salsa of your choice. The hotter the Salsa flavor, the spicier this dish will be so keep that in mind if you do or don’t like things spicy so you can adjust accordingly. After the Meat is fully cooked, remove from the pan and place in a Large Bowl off to the side for a few minutes. Using the rendered fats from the meat, add the Bell Pepper to the Cast Iron Skillet and cook the Bell Peppers for a couple minutes before adding the meat back into the Skillet. 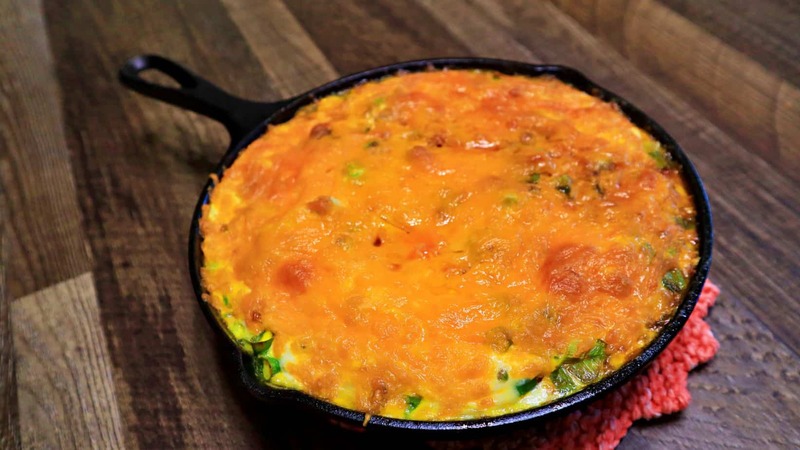 Cover the meat with 5-6 Slices of the Roma Tomato, sprinkle with the diced Green Onion, then pour the 8 Scrambled Eggs on top of the mixture, and top with the Shredded Cheddar Cheese. Place the Skillet in the Oven for about 30 Minutes, or until the egg mixture is firm and the cheese is bubbly. Remove carefully (the Skillet will be VERY hot), allow to cool a few minutes, and then serve. Is there a place where I can save your recipes? Sally, what I do is copy the recipes then paste them in a docs app. I have hundreds in my docs app listed under KETO Recipes. You could put into Excel. Hope this helps you as it has me. I just used the print button on the top left of the recipe – is just below the advertisement for printing – don’t use the add on ads that appear – they are awful. I save as a PDF and have my recipe file on my desktop…easy-peasie! Our print feature should remove the ads too. There is an app “Copy Me That “ that I use, it is great. You can make categories and save each recipe under that category. For the nutritional facts I take a picture of those shrink it down and add it to Copy Me That as an additional picture. Give it a try it’s great! Can you walk me through the steps to use copy me that? I have the app but can’t figure it out. You could probably use a dutch oven pan. I make them in large muffin pans. Great for portion control too. I was wondering what size frying pan you used? William, the recipe does not call for Parsley. The Cilantro is for garnish, so you can add it after you have cooked Frittata and plated the servings. That looks good family meal tonight. with salsa and sour cream on top. Thank you for the recipe! I see the nutritional info but don’t know how to add it into Carb Manager. Hiw can I do this? I was looking for an option to print this. Is that possible? Debbie there is a Print Icon near the top of the article. Near the upper left of each recipe article. Up where the text starts. Can this be made ahead and put into the fridge before baking? What temp do you set the oven? Does it freeze well, for left overs? OMG, this was amazing. A definite recipe for rotation. Wonder how well it would hold up freezing any leftovers?